A lot of spectacle here but I love the opening where the child is traumatized by tales of cowardice. This was my fathers favorite movie. And another great one that came out in the best year for movies - 1939. 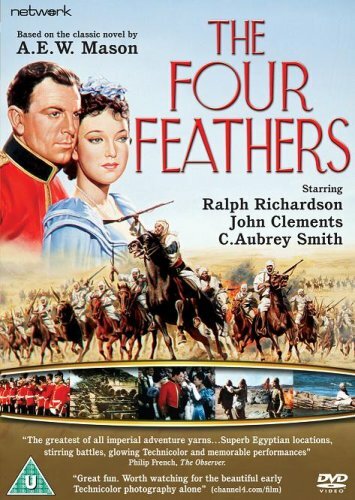 I remember exactly where and when we saw THE FOUR FEATHERS for the first time. We were visiting my parents at Christmas of 1977 in California. 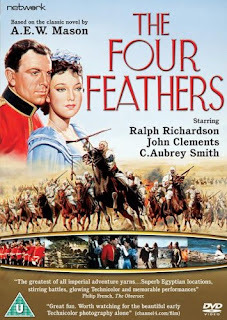 New Year's Day they were showing THE FOUR FEATHERS, but when it came on it was not, as listed, the 1939 version, but rather a new made-for-British TV version, starring Beau Bridges (yes, really), Robert Powell, Simon Ward, and Jane Seymour. I remember it as being pretty good, but I had to wait several years until I got to see the 1939 version. I've seen a couple of versions of this, probably on TCM, but don't know if this was one of them. Is this a colorized version (guessing from the poster) or B&W? No, now looking at the trailer, I guess not. Saw it for the first time years ago when a pre-TCM's American Movie Classics ran old films commercial free. It's up there with 1938's The Adventures of Robin Hood, 1948's The Three Musketeers, 1940's Northwest Passage, and 1939's Gunga Din (Din is sadly more often mispronounced to rhyme with pin instead of green, but if memory serves the movie gets it right) for my all time favorite adventure films. I've yet to get to the 1955 remake, 1955 Storm Over the Nile which used the same script and has a great cast, or Heath Ledger movie (I've always felt had he lived HL would be the Michael Caine of Australia) or the 1977 TV remake with Jane Seymour and, one of my favorite modern actors, Beau Bridges. I've seen it two or three times and enjoyed the hell out of. I believe that Len Deighton makes a (fairly sarcastic) reference to the movie in The Ipcress File.